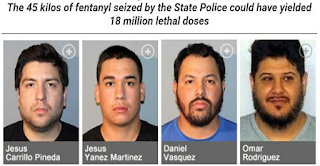 Jesus Carrillo-Pineda, 31, and Daniel Vasquez, 28 Two men who were arrested with enough fentanyl to kill the entire population of New York City and New Jersey were sentenced to extended prison time. 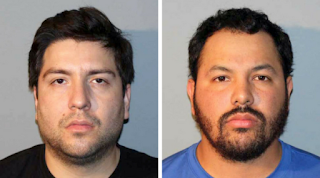 Jesus Carrillo-Pineda, 31 and Daniel Vasquez, 28, were arrested after police spotted them with a tractor-trailer full of fentanyl in a North Bergen parking lot. Police seized about 100 pounds of fentanyl during the bust. Carrillo-Pineda was sentenced to 10 years in state prison while Vasquez was sentenced to six years.